We at Wonderful Cinema like nothing more than to watch a film without the slightest idea what it is about other than a strong recommendation that it is worth seeing. In this way we are always surprised, even if not always pleasantly. 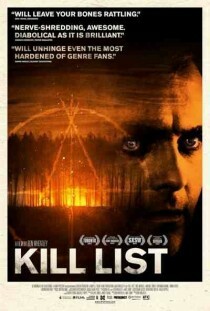 Kill List begins as a domestic drama and proceeds to very unexpected places. The film, directed by Ben Wheatley, successfully meshes an ever-increasingly violent sequence of events that takes you completely by surprise. You can find more information on this British movie on Wikipedia and IMDb. Ignore the mediocre IMDb user rating; this film is great. I love your site because you’re always posting movies I’ve never heard of, I’m going to have to check this one out, thanks for posting.